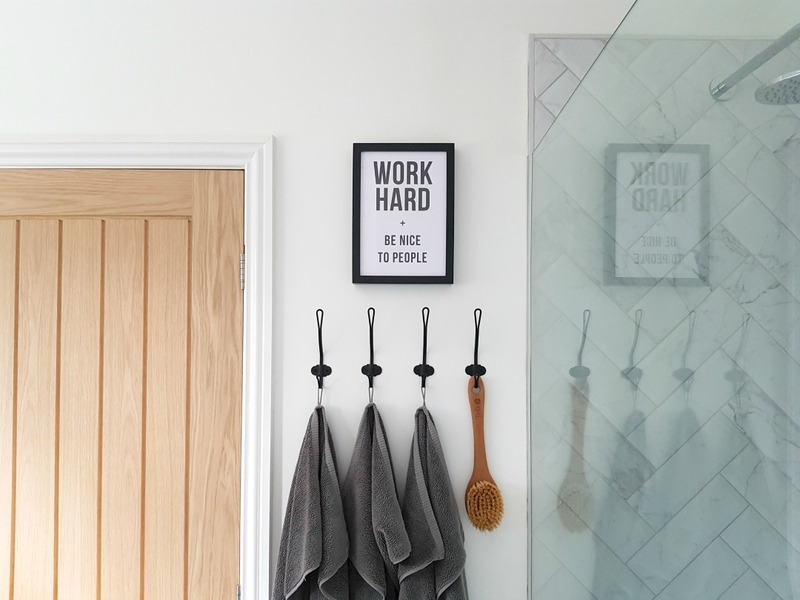 Our criteria for creating our family bathroom was simple – functional, child-friendly, easy to clean and fresh, with no clutter. Easy to clean came very high up on list when making decisions. We both hate doing any more cleaning than necessary, and we wanted to create a space that would remain easy to keep tidy. Back in January, we bought most of the items for our new bathroom. We planned exactly what we were going to buy a few weeks before, and then waited for the January sales to take advantage of any discounts. One of the first decisions we had to make was where to build the bathroom wall and this is something we agonised over night after night. 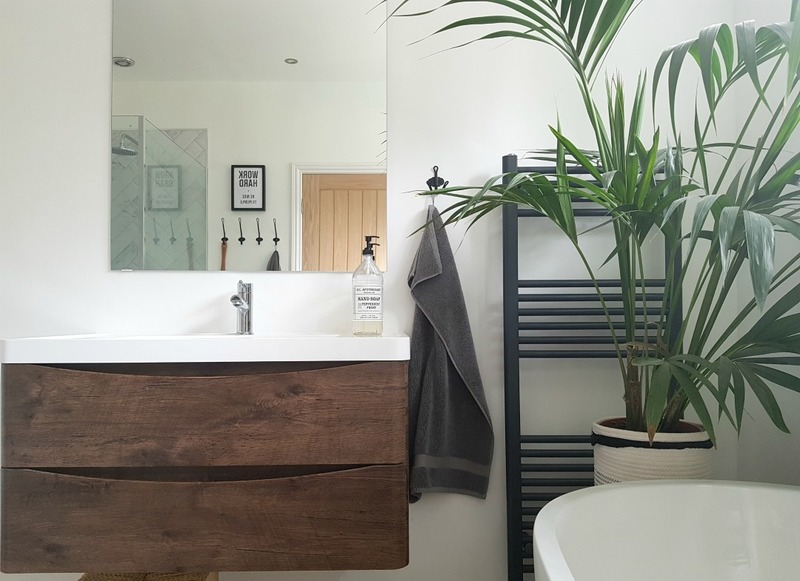 We measured the space again and again – checking there was enough room for the toilet, measuring between the bath and the wall, imagining where the shower glass would be and where the vanity unit would go. 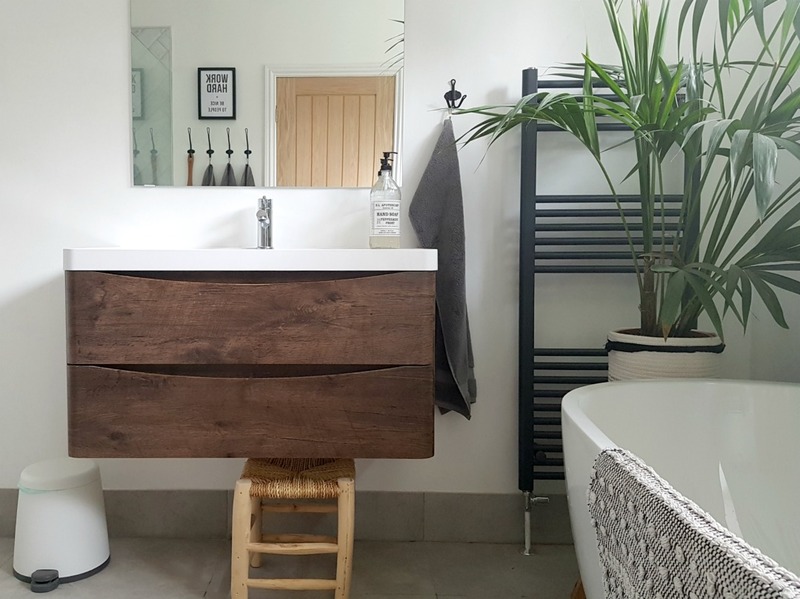 It felt quite daunting to create a whole bathroom from scratch, and we wanted to get it right. We also decided to build a false wall to give some privacy if one person is using the toilet and another using the shower (it happens!). Sometimes I think that Jared and I overthink our interior decisions, but it is so much money to spend, to not feel happy with everything. The light switches, shower valves and towel hooks are lower than usual, (but still fine for adults) so that the boys can reach everything. For the towels they need a stool, but we checked that they could reach before installing the hooks. Our boys only have a bath once a week (usually a Sunday night), and the rest of the time they shower. It is nice that Win and Ru can get in and out of the shower by themselves, without any help. We decided to place the shower valves at the beginning of the wet room, not directly under the shower head. This is so that the shower can warm up before you hop in. Underfloor heating is installed beneath the walkway to the sink and around the toilet, just to take the edge off freezing cold tiles in the winter. It wasn’t as expensive as we expected. We decided to add a handheld shower inside the wet room so that we can rinse the boys off quickly if we need to. The bathroom is painted in anti-mould paint, which is wipe clean. Colours are quite limiting in this type of paint, but we had success with it in our last bathroom and it’s good stuff. 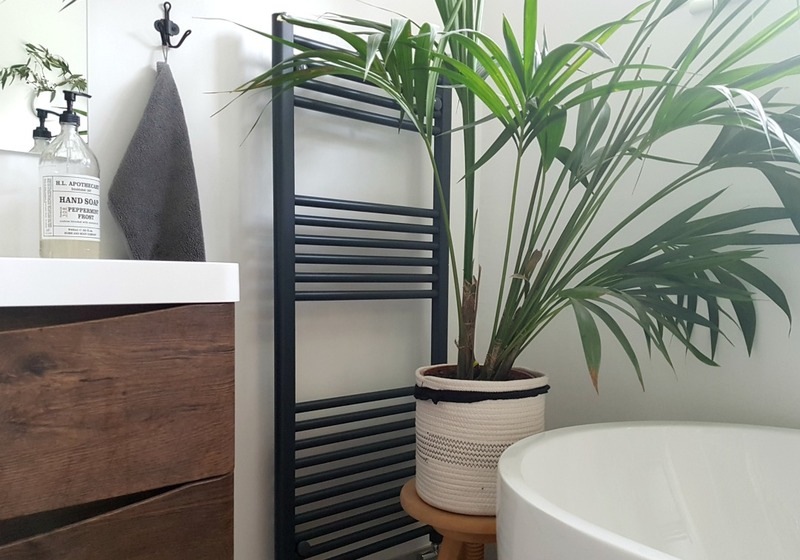 This was the main reason that we were so keen to install a wet room – no shower tray, no sliding doors and no awkward places to clean. I am happy every day that we made the decision to install a wet room. The floor tiles we installed aren’t as easy to clean as we’d hoped, but we wanted tiles that wouldn’t become slippery when wet, so it was a bit of a compromise. We decided to have a proper vanity unit with two large drawers to keep toiletries out of sight. The boys don’t have much now, but later they may want deodorant, hair gel and other products, so we wanted to pre-empt having a home for them. 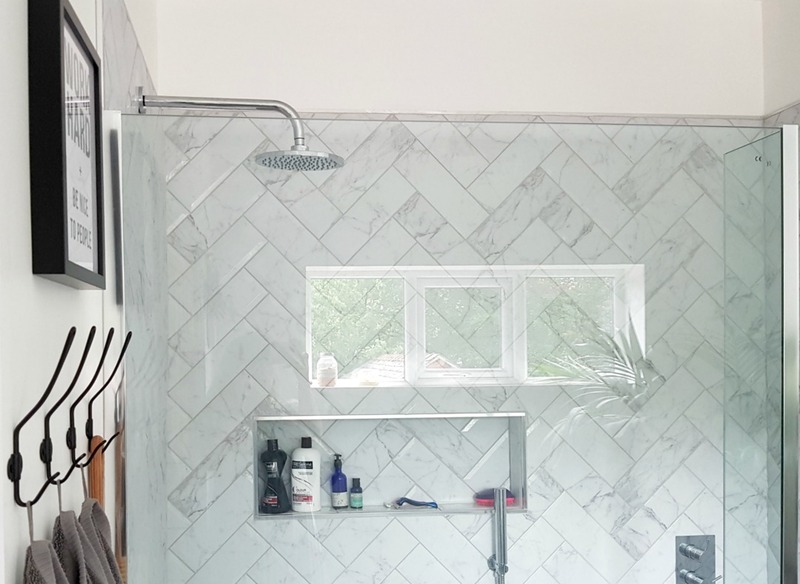 We’ve never had great success with a shower tidy, so we decided to install a niche in the wet room – a glorified shelf to keep shampoo and conditioner. A shelf above the toilet for toilet roll and cleaning products. This was a decision that came later, as we wanted a specific home for everything, plus the toilet area looked too white and clinical. 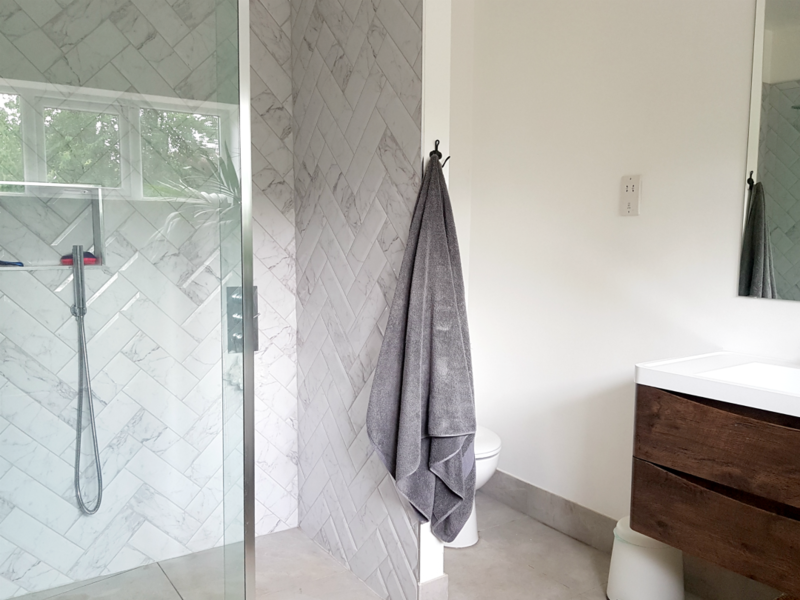 Overall, we are both absolutely thrilled with our family bathroom renovation – other than the floor tiles (that could be easier to clean) – we wouldn’t change a thing. I’ll probably add a few more plants, and the shaving point needs to be moved (as it’s currently floating), but nothing else major. 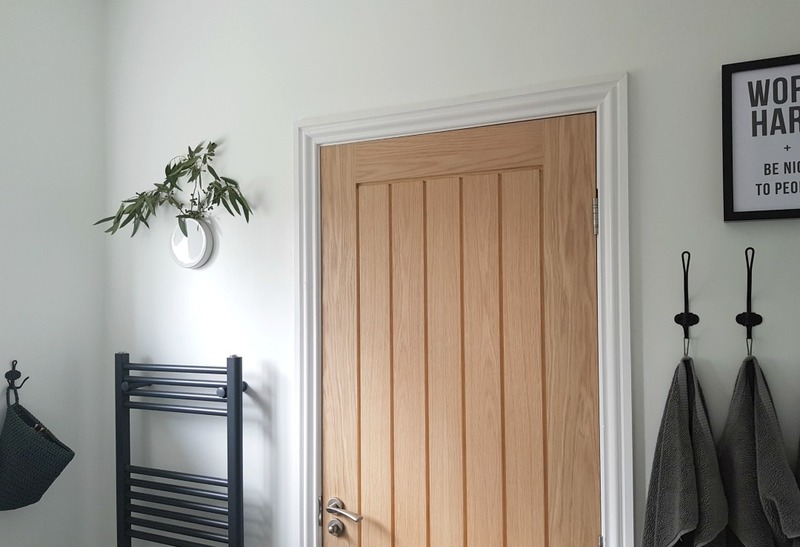 Our initial quote for installation and materials was an eye-watering £11,000, but our renovation ended up costing just over £4,000. I think patience saved us a lot of money – waiting for items to go in the sale (because we didn’t want to compromise on quality), shopping around and being flexible with our timescale. Our bathroom always seems to be light, so is incredibly difficult to photograph – apologises that the photos are really not the best.